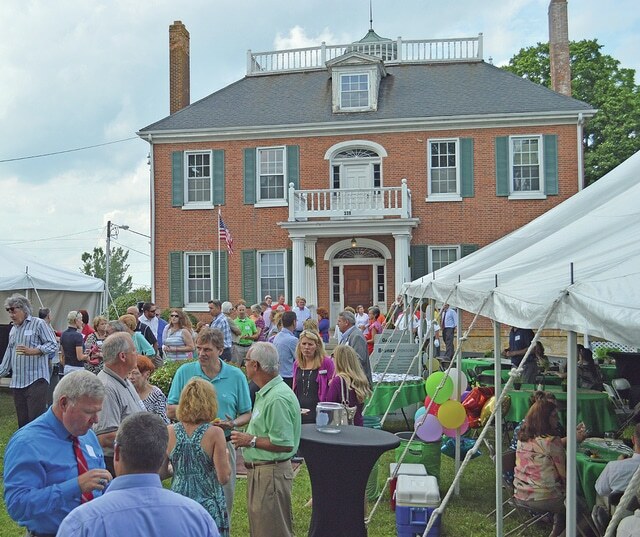 Some of the crowd mingles at the Highland County Chamber of Commerce Party on the Lawn held in front of the Scott House in Hillsboro. In the wake of a successful “Party on the Lawn” last week, Highland County Chamber of Commerce President Melissa Adkins this week thanked everyone who made it a success. As The Times-Gazette previously reported, the 25th annual dinner entitled “Party on the Lawn” on June 25 drew more than 160 guests. In a press release, the Chamber said the guests came out to enjoy a sunny evening of networking on the lawn of the historic Scott House which has housed the chamber for the past year. Dinner was provided by All Seasons Catering, Batter Up Bakery, Cow-A-Burger, Farm House Catering, and Ponderosa. Highlights of the evening include a rendition of the national anthem performed by Tom Zile and the Honor Guard, comments made by Chamber President Melissa Elmore and Chamber Board Chairman David Fauber, commendations by representatives from Ohio Secretary of State Jon Husted, State Treasurer Josh Mandel ,and Speaker of the Ohio House Cliff Rosenberger, and a champagne toast to 25 years of success given by Dr. Kevin Boys. The evening ended with drawings for nine gift baskets from local businesses. For more information about the Highland County Chamber and to learn how the Chamber can help your business, call 937-393-1111 or visit TheHighlandChamber.com.